The Eris E8 features a 8" Kevlar® low frequency woofer and a 1.25" silk dome tweeter. It uses Class AB amplification offering 75W to the woofer and 65W to the HF driver. It's frequency response it rated 35Hz —l 22kHz, quite the impressive range for such an affordable monitor. Both of the Eris models feature a full compliment of inputs. You've got a Balanced XLR, Balanced TRS, and Unbalanced RCA connection. This means it will connect to just about any kind of audio interface or computer sound card. The Eris E8 also includes a full compliment of tone controls for tailoring the speakers to the acoustic needs of your room. The HF control is shelving control for everything above 4.5kHz. It can boost or cut this range by ±6dB allowing for precise adjustment. For the most part, this control is best left at unity. If the sound is too high and brittle then cutting a dB or two can help, and vice versa. The Mid control is a bell curve centered at 1kHz that extends a full octave in both directions. Usually, this control is also best left at unity unless there are some strange standing waves in your room. The Low Cutoff is selectable between 80Hz and 100Hz with a -12dB per octave slope. This control can be used if you'll be using a subwoofer in your monitoring system (or if you want to emulate cheap stereo speakers). 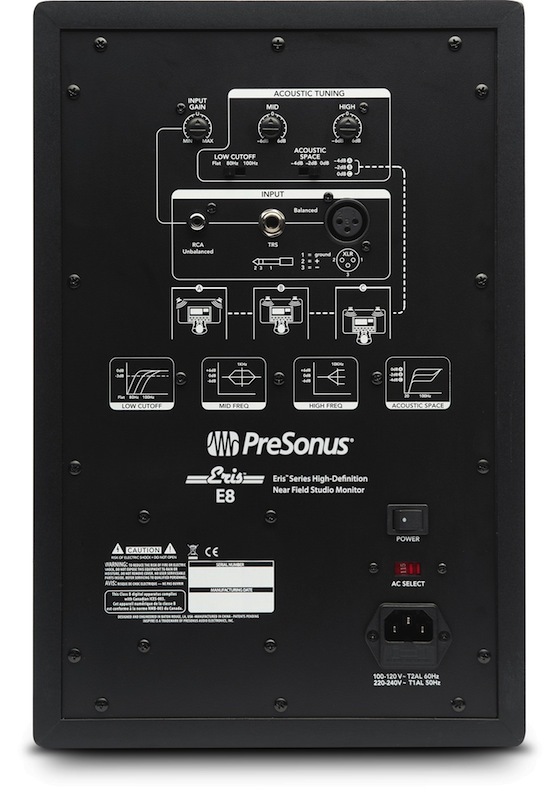 The final control is what Presonus calls the Acoustic Space control. It is a low frequency attenuator designed to deal with boundary issues when the speakers are placed to close to the behind wall or in a corner. It attenuates all frequencies below 800Hz by a selectable -2dB or -4dB.